Our millwork manufacturer is a rarity in the industry. We are a sawmill and harvest Northern hardwoods including such rarely used but beautiful species as red elm. And we stock over a million board feet of kiln dried hardwood lumber in our climate controlled warehouse. We also have world wide contacts so we can provide species such as West African mahogany, Brazilian ipe, Rocky Mountain alder, and Pennsylvania cherry. Our operating word is “custom”. 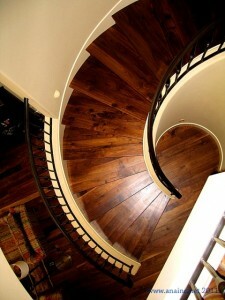 We will produce any pattern that is a standard of well known trim and stair part manufacturers. And we will custom grind our knives to produce any pattern you might imagine. The only thing we need to say regarding stair parts is: We will turn any species into any style, and we can marry our turnings with any wrought iron or non wood balusters you can imagine. Because we are both a sawmill and a millwork manufacturer, we can provide our products factory direct and bypass millwork wholesalers, which will provide you with significant savings. © 2019 Cross Country Solutions Inc. All Rights Reserved.